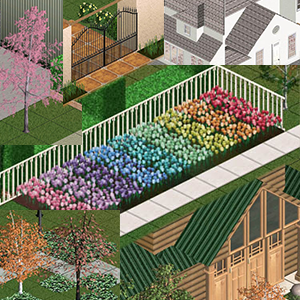 These zips contain most of the garden plants and trees as wells as windows, doors, columns and unique building sets such as the iron gate, gables, villa arches and hills. The "Sets" zip also contains some buy objects. Single walls and floors are in the first two zips. 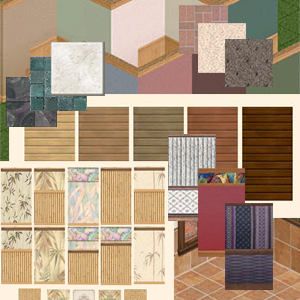 Sets of co-ordinated walls and floors in the last zip. I tried to make sure there was no duplication. 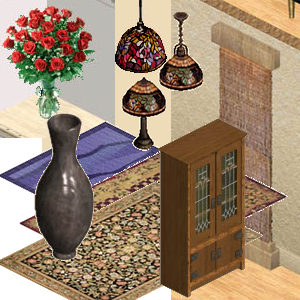 Furniture and decors items zips include a bunch of rugs and flowers plus the animated waterfall. Contains all the residential houses, community lots and neighborhoods. The clean neighborhoods are bulldozed. The white neighborhood includes all lots 1-10 plus the unleashed Lots with white walls and floors, ready to decorate.